After beating the Cleveland Cavaliers in four games, the Golden State Warriors have won the 2018 NBA finals. We decided to build an animated map of Twitter mentions of #DubNation and #StrengthInNumbers, two hashtags used by Golden State fans. 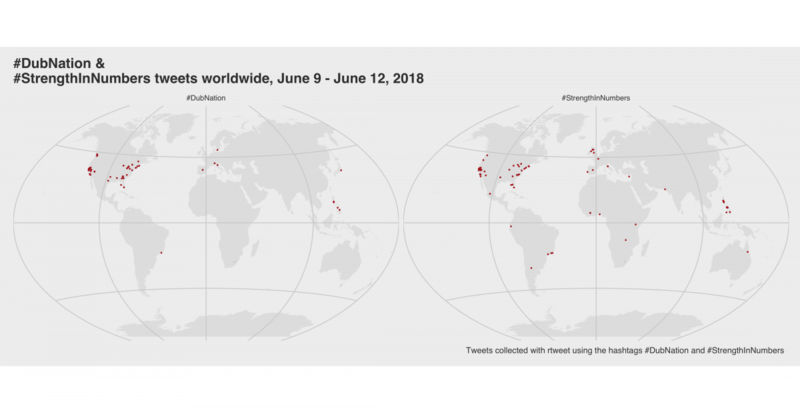 This post will walk you through 1) collecting data from a Twitter API using the rtweet package, 2) creating a map with the tweets using the ggmap, maps, and mapdata, and 3) animating a map with the tweets with gganimate. For help setting up Twitter API credentials, there is excellent documentation on the package’s website but I am just going to go into more detail in the image below. 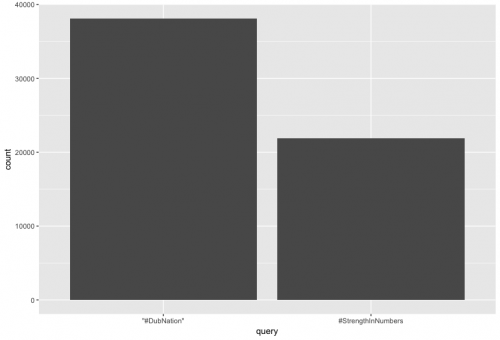 We will start by collecting data on a certain hashtag occurrence. When I am writing this, it is game three of the NBA finals, so I will search for the hashtag #DubNation. The function for collecting tweets is rtweet::search_tweets(), and it takes a query q (our term). We will use all the default settings in this inital search. 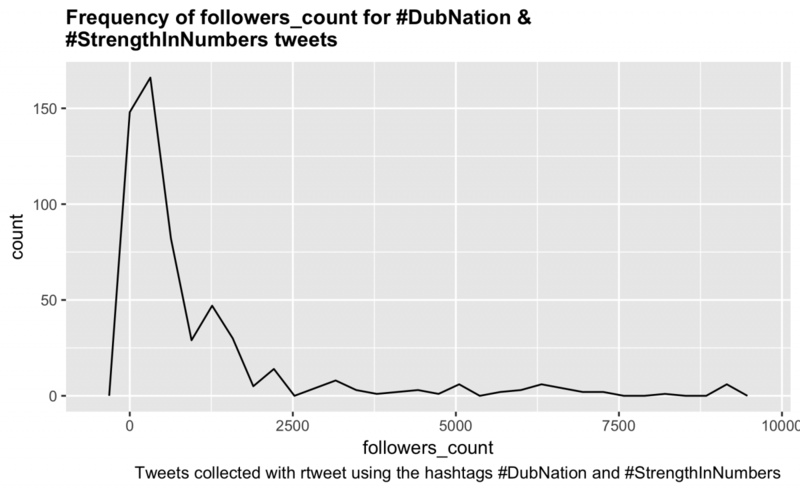 I’ll use rtweet::search_tweets2() to collect data for two hashtags now, #DubNation and #StrengthInNumbers, but set the n to 50000 and the retryonratelimit argument to TRUE. The previous data frame had 88 variables in it, which includes the variables on users and tweets. We can use the rtweet::users_data() function to remove the users variables. The base::intersect() function allows us to see what variables from DubNtnStrngthNmbrs will end up in the results from rtweet::users_data(). I added tibble::as_tibble() so the variables print nicely to the screen. I’ll store the contents in a new data frame called UsersDubNtnStrngthNmbrs. I can also create another data frame with the tweet information using the rtweet::tweets_data() function. Just like above, I will display the variables in this new data frame (but limit it to the top 20). I will store these variables in the TweetsDubNtnStrngthNmbrs data frame. The tweets are stored in the column/variable called text. We can review the first 10 of these entries with dplyr::select() and utils::head(). The rtweet package also comes with a handy function for plotting tweets over time with rtweet::ts_plot(). I added the ggthemes::theme_gdocs() theme and made the title text bold with ggplot2::theme(plot.title = ggplot2::element_text()). 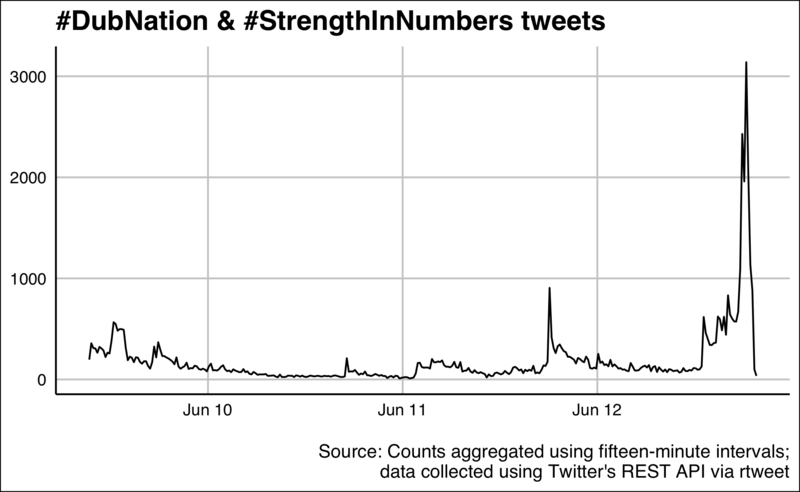 This graph shows an increase in tweets for these hashtags between June 09 and June 12. The largest spike is clearly yesterday’s parade. I can also add some geographic information to the twitter data (i.e. the latitude and longitude for each tweet) using the rtweet::lat_lng() function. This function adds a lat and lng variable to the DubNtnStrngthNmbrs data frame. I verify this with names() and tail(). 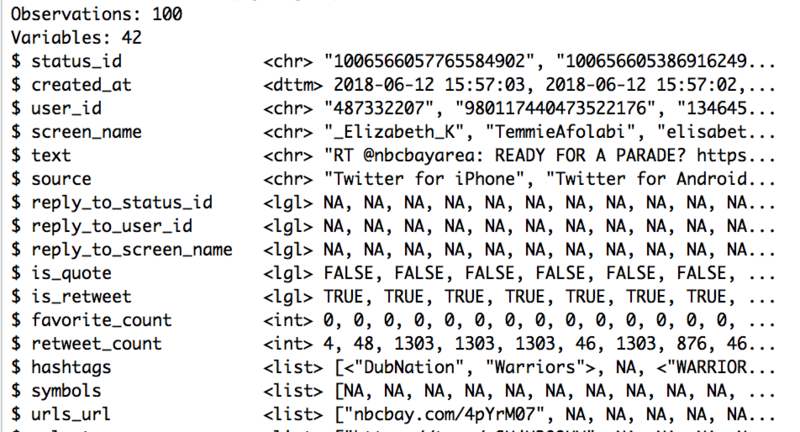 I will check how many of the tweets have latitude and longitude information using dplyr::distinct() and base::nrow(). Wow, only 156 of our 60,000 tweets have latitude and longitude information. Bummer! I’ll rename lng to long so it will be easier to join to the state-level data. I will use the ggplot2::map_data() function to get the "world" data I’ll build a map with (save this as World). 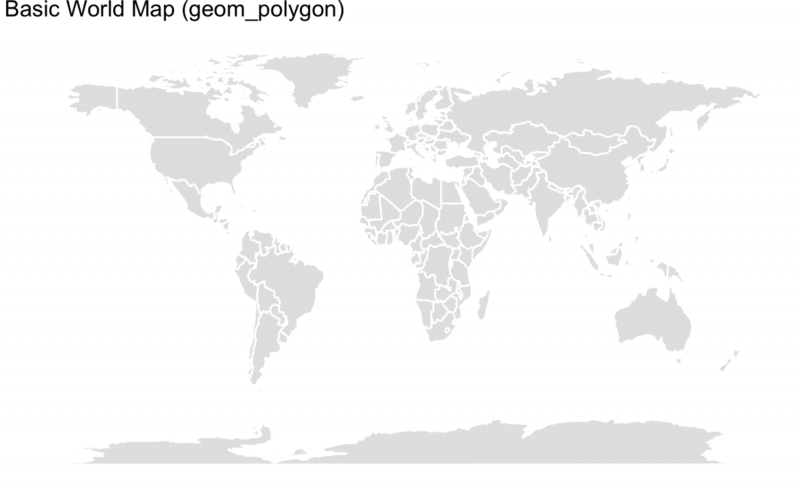 The ggplot2::geom_polygon() function will create a map with the World data. The variables that build the map are long and lat (you can see why I renamed the lng variable to long in DubNtnStrngthNmbrsLoc). I added the Warrior team colors with fill and color. Now that I have a basic projection of the world, I can layer the twitter data onto the map with ggplot2::geom_point() by specifying the long and lat to x and y. The data argument also needs to be specified because we will be introducing a second data set (and will not be using the World data). This is what’s referred to as the mercator projection. It is the default setting in coord_quickmap(). I also add theggplot2::theme_void() for a cleaner print of the map (without ticks and axes) and changed the dimensions of the output PNG file. 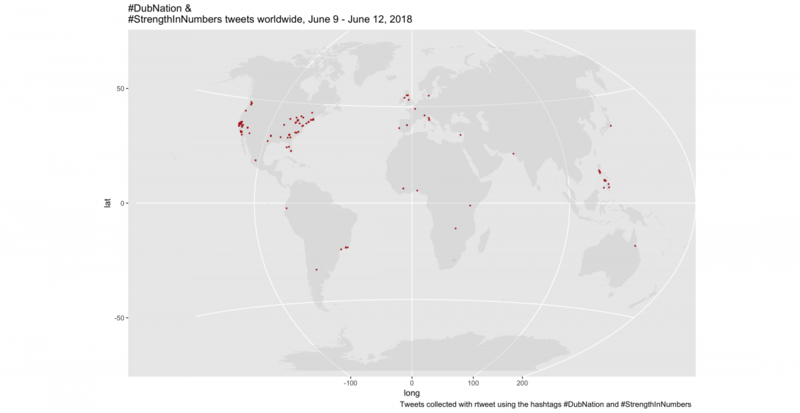 gg_Merc_title <- "#DubNation and #StrengthInNumbers tweets worldwide, June 9 - June 12, 2018"
gg_Merc_cap <- "Tweets collected with rtweet the hashtags #DubNation and #StrengthInNumbers"
The Mercator projection works well for navigation because the meridians are equally spaced (the grid lines that runs north and south), but the parallels (the lines that run east/west around) are not equally spaced. This causes a distortion in the land masses at both poles. The map above makes it look like Greenland is roughly 1/2 or 2/3 the size of Africa, when in reality Africa is 14x larger. Say we wanted to zoom in on just U.S. tweets. The following code, adapted from above, will display only U.S.-based tweets on a map. 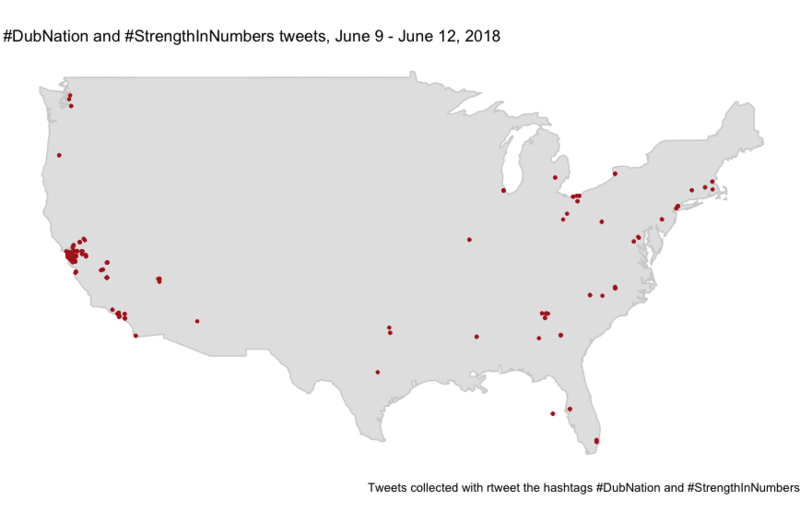 gg_USMerc_title <- "#DubNation and #StrengthInNumbers tweets, June 9 - June 12, 2018"
gg_USMerc_cap <- "Tweets collected with rtweet the hashtags #DubNation and #StrengthInNumbers"
An alternative to the Mercator projection is the Winkel tripel projection. This map attempts to correct the distortions in the Mercator map. This map gets added via the ggalt::coord_proj() function, which takes a projection argument from the proj4package. I add the Winkel tripel layer with ggplot2::coord_proj("+proj=wintri") below. ggDubWT_title <- "Worldwide (Winkel tripel) #DubNation &\n#StrengthInNumbers tweets"
ggDubWT_cap <- "tweets collected with rtweet the hashtags #DubNation and #StrengthInNumbers  "
To learn more about maps check out this document put out by the U.S. Geological Survey on map projections. The description provided in the show West Wing covers some of the distortions in the Mercator map, and this video from Vox does a great job illustrating the difficulties in rendering a sphere or globe on a 2D surface. The rtweet package can collect Twitter data over a period of 7-10 days. The data we have in DubNtnStrngthNmbrsLoc ranges from "2018-06-09 09:21:44 UTC" to "2018-06-12 19:39:51 UTC". 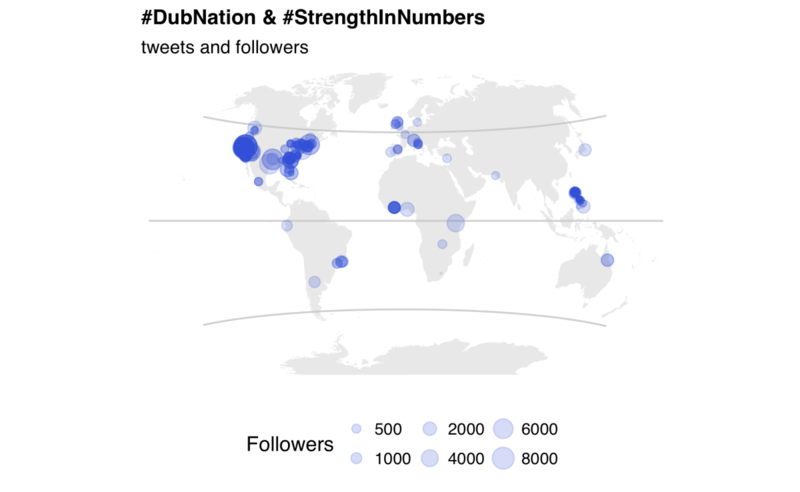 I want to see the spread of the #DubNation and #StrengthInNumbers tweets across the globe, but I want to use the point size in this this animated map to indicate the number of followers associated with each tweet. gganimate is the ideal package for this because it works well with ggplot2. I can start by looking at the number of followers for each account (followers_count) on the observations with location information (long and lat). This looks like there are a few screen_names with > 10,000 followers. I can get a quick view of the distribution of this variable with qplot(). But first, we must remove these high-follower outliers that are skewing the distribution. Great! Now I will create another static Winkel tripel map before animating it get an idea for what it will look like. I start with the ggWorld2 base from above, then layer in the twitter data, this time specifying size = followers_count andggplot2::scale_size_continuous(). The range is the number of different points, and the breaks are the cut-offs for each size. I also remove the x and y axis labels, and add the ggthemes::theme_hc() for a crisp looking finish. 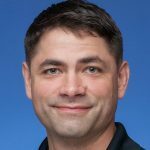 I learned a helpful tip from Daniela Vasquez over at d4tagirl to build two data frames to use for displaying the animation before and after the points start appearing. These are best built using dates just outside the range of the created_atfield. # min(DubAnimateData$created_at) # "2018-06-09 07:43:46 UTC"
# max(DubAnimateData$created_at) # "2018-06-10 02:36:31 UTC"
Now I can use these two data frames to add additional layers to the animation. gganimate takes a frame argument, which is the value we want the followers_count to change over time (created_at). The cumulative = TRUE tells R to leave the point on the map after its been plotted. Now I have an animation that displays the tweets as they appeared in the two days following the NBA finals. rtweet has a handy export function for these twitter data frames as .csv files.